Drive-Through Racks allow a lift truck to enter the rack from either side to pick up or pull out pallets. 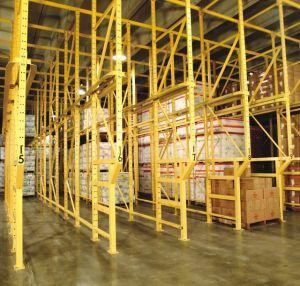 Loads are supported by rails attached to upright frames, and lift trucks are driven between uprights to reach pallets. 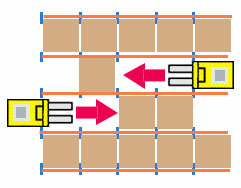 This is done because pallets can slide backwards on a continuous rail. It's open at both ends, allowing first-in, first-out storage. Drive-Through Racks offer the ability to store a large amount of similar loads in a smaller area. Selectivity is sacrificed, but storage density is enhanced since many pallets are stored and are available through a single pallet position. Requires loads of a similar width. Drive-in / drive-thru racking can utilize either SK3000 structural channel or SK2500 bolted tubular uprights. Drive-through is used to store many pallets of a similar SKU or product. Lift trucks drive into the rack to extract the first pallet they come to. Pallets in the center of the rack system are not accessed as frequently as those on the edges.